Barbacoa was originally cooked in earth ovens, a culinary technique that is ancient and found all over the globe. In San Antonio, where there is evidence of human habitation dating back 13,000 years, archaeologists have found layers of heated rocks suggesting that it was part of an earth oven (a pit) built 4,500 years ago. The archaeological site is called Olmos Dam because the dam is nearby. into a huge pile of coals. While the fire was burning he would prepare a cow head, sometimes a goat or other meat, by wrapping it tightly in burlap. It was at this time that my mother would appear from the house with a bowl of spices, blended with water, and throw them onto the burlap as the meat was being wrapped. Apá, dad, shoveled half the coals into the bottom of the pit and placed the burlapped meat on top of them. Again, thankfully, my mother intervened, and with a flourish threw in a bowl of liquefied spices onto the top of the burlap bag. The men shoveled the rest of the coals on top of that, laid a metal sheet over the pit, and then covered everything with dirt. There was a pipe sticking out of the hole. Enjoying barbacoa just out of the earth oven. With my dad and brothers. Eight to 12 hours later the pit was dug up and we enjoyed the most flavorful, moist, delectable barbacoa in the world. It was amazing. This was during my childhood and continued until the 1990s when apá passed away. Today I don’t have any space in my backyard to build a pit, so this recipe is intended for the indoor home oven. 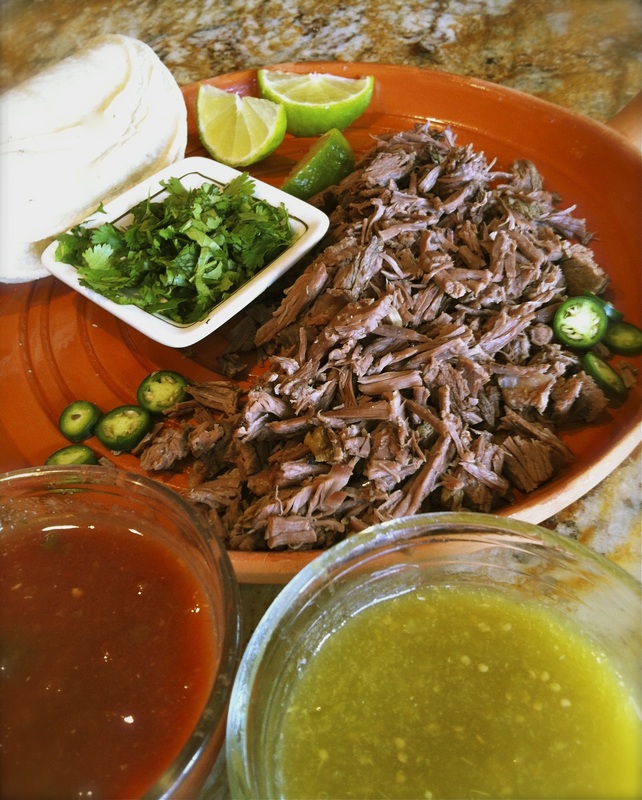 I don’t use a cow’s head or beef cheeks, which are the requisite for barbacoa. If you want to taste delicious authenticity, use beef cheeks instead of the roast I recommend in the recipe. Either way, the result is evocative of the taste I remember, albeit with no smoke. The spices are those my mom used, as best I can determine by checking with my family. I hope you enjoy it, especially with your loved ones. 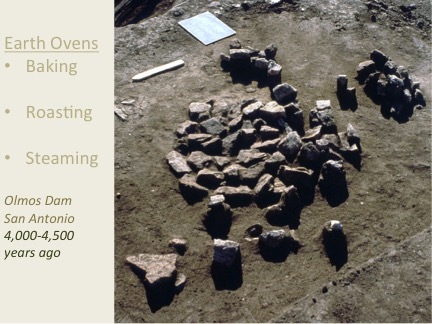 We continue a 4,000+ years tradition of savory slow cooking. 2. Cover tightly, place in a 200°F oven and cook for 6–8 hours. Turn the meat over once during cooking. 3. When the beef is done, place it on a cutting board or large bowl and, using forks or wooden spoons, pull the meat apart. Adjust the salt. Keep the meat warm for making tacos. To make the tacos, serve it with hot corn tortillas, an array of salsas, fresh coarsely chopped cilantro, and Mexican lime wedges. An abrupt hiatus in all conversation, with groans of satisfaction, will ensue. Had me thinking of a earth pit in my own backyard. Cant dig up the concrete. But hey there must be room somewhere. Wondering if I can do this at the lake? I have to try the recipe tho. My sister will be helping me and I hope we dont do the recipe wrong. Thank You for this incredible choice food to share! Thanks for letting me know that you connected to my memories of this wonderful experience. 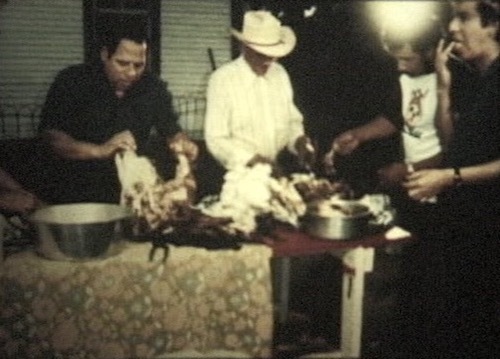 I’m sure that many other families share the barbacoa as a community and family ritual. Food is terrific in so many ways. What an incredibly rich experience you were fortunate to have growing up, Adan! I imagine when you were writing this incredible description of remembering the rite of preparing, cooking, and enjoying barbacoa with your family growing up that you could smell the aromas, hear your family’s voices, feel the anticipation, and taste the rich experience of this beautiful family ceremony. I know, I did. Thank you, once again, for sharing.